As interesting as Copenhagen is, you might want to take a day trip tour to the Danish countryside and visit three colorful castles while your ship is docked in Denmark. We did a half-day shore excursion from a cruise ship, driving along the scenic coast road of the "Danish Riviera", stopping at Frederiksborg Slot, Fredensborg Slot, and Kronborg Slot along the way. Each of these three castles had its own special attraction. Frederiksborg is an immense castle in the village of Hillerød, about 25 miles northwest of Copenhagen. The village is the middle of North Zealand and is surrounded by lush woodlands. The drive from Copenhagen is interesting, with many thatched-roof cottages along the route. Although the oldest parts of the slot (castle) date back to 1560, most of the slot was constructed between 1600 and 1620 by Christian IV, the builder King of Denmark, who was born in the castle. It is often called the "Danish Versailles" since it is the major castle in Scandinavia, constructed on three islands in the castle lake. The slot is built of red brick, with a copper roof and sandstone facade. Danish royalties used the slot for over two hundred years, and Christian IV's chapel is still used today. It is filled with the shields of many families and has an organ that dates back to the 17th century. Although photos are not allowed inside Frederiksborg Slot, we thoroughly enjoyed touring the castle. The Frederiksborg Castle garden is also a must-see. You'll need to allow some time to wander out back of the castle to visit this baroque garden, which was refurbished to its original style in 1996. Just a few miles from Frederiksborg Slot is Fredensborg, the summer palace of the current Danish royal family, built in 1720. We only had a photo stop at the palace, which was being remodeled. Fredensborg is also in a small village, and many compare the atmosphere of the village and the castle to Windsor in England. The style of the castle is quite different than Windsor, with baroque, classical, and rococo features. 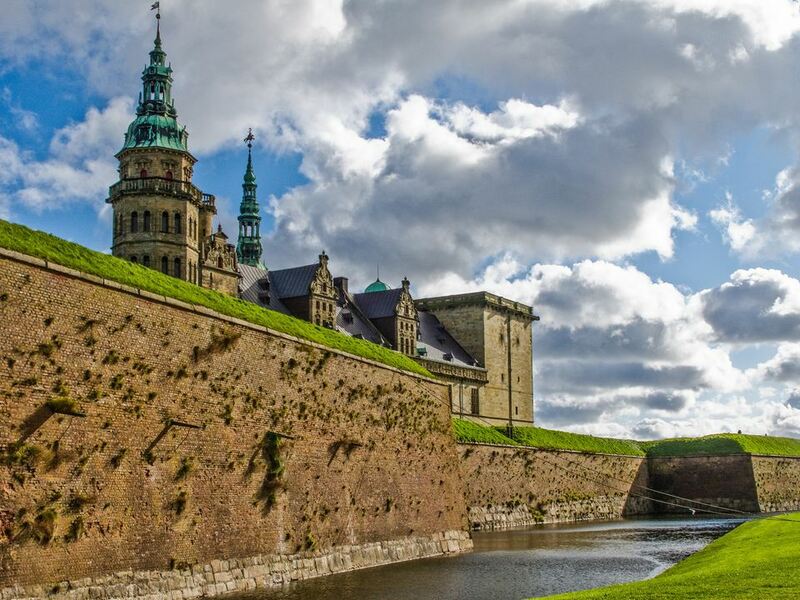 Anyone who is a fan of Shakespeare must visit the village of Helsingør (Elsinore), about 15 miles northeast of Hillerød at the narrowest point of the channel separating Denmark from Sweden. The castle sits on a peninsula jutting out into the Øresund. There is no evidence that Shakespeare ever visited Helsingør or Kronborg Castle, but he used it as a setting for his famous play Hamlet. (He renamed Kronborg "Elsinore Castle",) Kronborg looks much more like a fortress than the other two slots we visited. It has numerous artillery compartments on ramparts, huge walls, and a moat. "Hamlet" is sometimes performed in the large courtyard of the Kronborg Slot. At one time in the early 15th century, all ships passing Helsingør had to pay a toll. The narrowness of the gap allowed the King's men to easily force all vessels to pay, and the city prospered and became a shipping focal point. For a while, Helsingør was even the second largest Danish city. After touring the three castles, we rode back to Copenhagen along the coast, with a quick look at the family home/museum of Karen Blixen, who wrote under the pen name of Isak Dinesen. We didn't stop at the museum honoring her legacy, but others on the ship who visited it found her story and life fascinating. The Karen Blixen museum is accessible from the Rungsted Kyst train station. Many cruise lines dock or embark/disembark from Copenhagen. Scandinavia is one of the most expensive areas of Europe to visit, so a cruise really helps keep the cost down since your "hotel" and meals are included. Spending a few days in this fascinating city allows time to venture outside the city.